We already assume that you have Tor browser installed and running. If you don't have it installed, you can download it from here and follow the installation instructions. 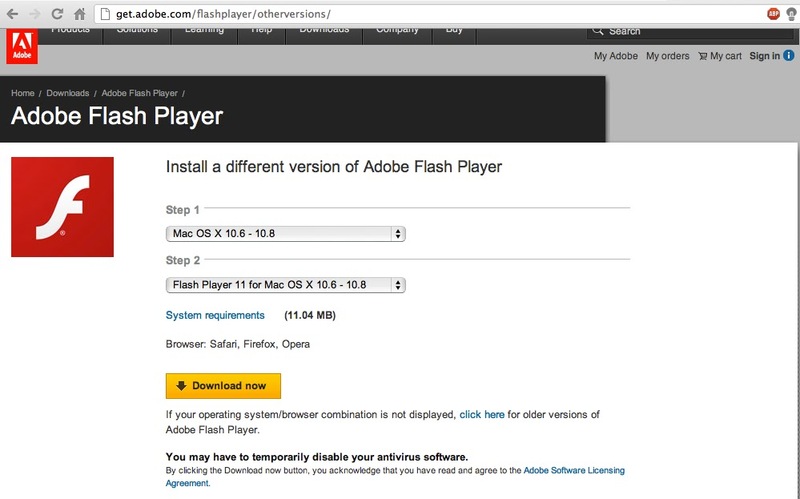 Step 1: Download and install Flash Player for Mac. 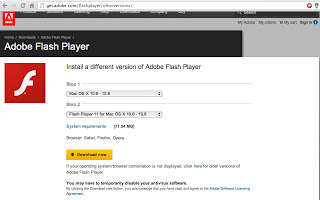 This tutorial uses Adobe Flash Player v11.10 (Download link - here). If you are using Google Chrome, you might see the window below. Click on "Do you have a different browser or operating system?" At the next window, choose the appropriate version of 'Mac OS X' as the operating system in Step 1 and 'Flash Player 11 for Mac' in Step 2. After downloading the .dmg package, install it as usual by running the Adobe installer from the package. Applications/Install Adobe Flash Player.app/Contents/Resources/Adobe Flash Player.pkg/Contents/Library. Restart the Tor Browser and open the Add-ons Manager at Tools->Add-ons and enable the Shockwave Flash add-on. Now, the Tor Browser is ready to use and supports websites that require flash player. Note: You may have to repeat Step 3 everytime the Tor Browser is started. I can't find the /Library folder at the end of the line? I get to the second Resources but there's no Library folder there? I have Mavericks. Tor found the plugin automatically You just had to enable it on the Tor settings. worked flawlessly for me. After spending hours looking for workarounds, messing with proxies and much more, this worked great. I couldn't find the two files in the directories you listed, but a quick finder search for "Flash Player.plugin" and "flashplayer.xpt" did the trick. Thanks for shearing this great information .After many hours i found it but i did not remember how i found this but this file is now in my folder.It is helpful for Graphic designer’s community. my directory paths happened to be different (flash 12, mac osx 10.7.5) but it still works, just searched for flashplayer.xpt, opened the enclosing folder and found the other one, then searched for extensions within the tor application folder.